Becoming a Rebreather Open Water Diver is your chance to explore a whole new world that most people don't get the chance to enjoy. The great thing is that you don't already have to be certified to start your training on a rebreather. 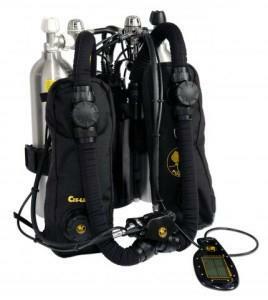 The Poseidon MKVI is the world's first rebreather for recreational divers. It is a fully closed, fully automated diving system that will make you part of the environment; not just a visitor. Our training is designed so that you can learn largely at your own pace and so that you can learn to dive an open as well as closed circuit setup. 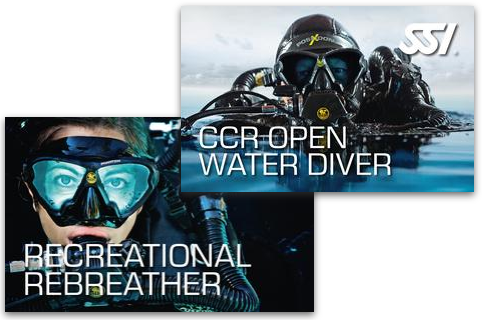 We want you to be able to dive on a standard setup or a rebreather by the time you have finished the class. The opportunities are limitless! You DO NOT have to be Open Water Certified! Since the Rebreather Open Water Diver is more specialized, this class is taught on a more individualized basis. No classes are scheduled until they are needed. First off, we need to know who you are. Make an appointment with our rebreather instructor and then you can come by the shop to get your free personal orientation where we can discuss all the class options that are available to you. Whether this is your first experience into the world of SCUBA or you are already certified, there will be a bit of classroom time to make sure you fully understand the machine that you will be using. You will learn open circuit diving as well as closed circuit by the end of the course. Practice, practice, practice! We will have you practice and repeat all of your skills in the pool until they become second nature to you. There is at least twice as much pool time as classroom time. Time to take the plunge. If you are not already, you will be doing dives to make sure you are Open Water Diver certified AND dives to get you qualified to use the rebreather. Congratulations! Copyright © 2007-2019 - Ascuba Venture Inc.